A couple of days ago we noticed that Johnny Manziel’s wife Bre Tiesi removed all traces of Johnny from Social Media including removing his last name from her social media profile. We also noticed that Johnny Manziel had removed his whole entire Instagram account at the same time. We rumors started circulating that the couples marriage could be on shaky ground. Well, today Bre was answering comments on Instagram and and that helped shed light on what was going on. 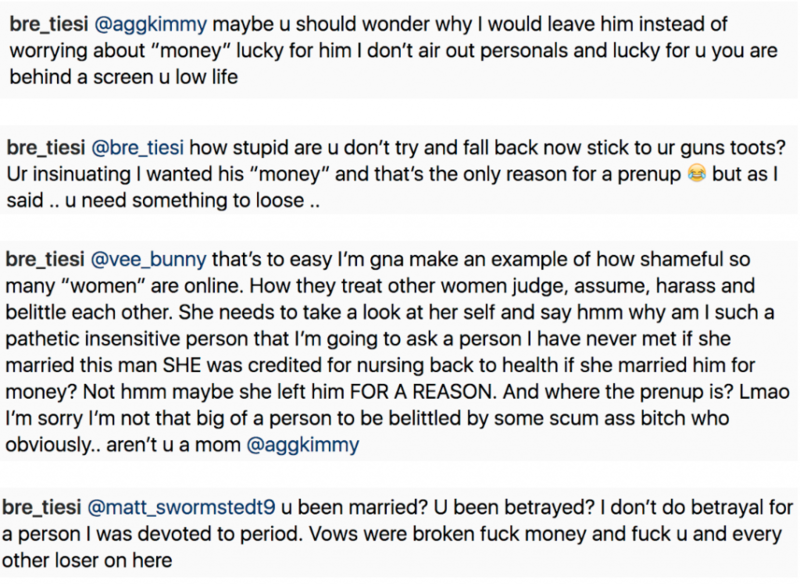 In those responses, she suggests that she left Manziel because “vows were broken.” She also became enraged when she was asked if she has a prenup with Manziel. Manziel who was essentially kicked out of the Canadian Football League is still trying to revive his football career and is has just signed on with The Memphis Express of The AAF. Let’s have a quick reminder of what Manziel will be missing out on now that she is gone. Last night was a success! Thank you to everyone who came to support @semouiller I appreciate you and love you all so much. Well it looks like she’s taking things well because those photos from vacationing in Indonesia are less than a day old.